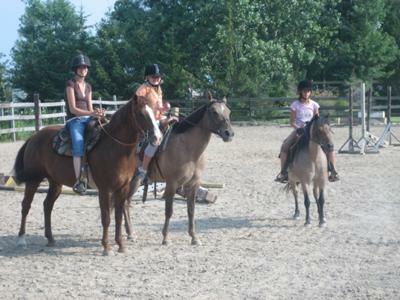 Last summer some friends and I went horse-back riding at Sunnylee Stables just outside St Thomas. We had fun and learned a lot from the instructor, who was called Jessica, I think, anyway, her parents Kimberley and Henry own it and we had a great time. We not only rode the horses, but we also learned how to groom them and put their saddles and bridles on and how to get them to walk, trot and canter. My Mom said that it was really good value for what we got as we were there longer than the hour we paid for! My horse was named Toy and my friends rode Pepsi and Milo. Before we went there I was scared of big horses, but we were able to brush the horses and get to know them before we rode them, and that was nice. I currently lease Toby I think that’s what you meant and he is the best I definitely recommend leasing there because you can spend endless time there and create a trust and bond with your horse and also to the person who was wondering how many horses are there, there are about 40! I currently lease a horse there, I absolutely love the friendliness of almost everyone. I was new to the stable in November and since then have learned so many new things! I go there and love it! Sunnylee Stables is a warm and inviting place to go and ride your horses. Friendly people, beautiful horses. All year round riding. Kim is an amazing person. My family loves it there! I part lease a horse at Sunnylee Stables and truly enjoy going there to spend time with my horse inside and outside in all seasons. We even go on trail rides in the winter. Great place to go for all your riding fun! I haven't been to Sunnylee yet but I want to come for a ride! How can I get a hold of Kim? I want to go there - do you know how many horses they have?